I wanted to share a colour moodboard with you all to give you a feel for how I work. This one has been created on the computer, but in the studio I have a large wall that is always covered in fabric scraps, photos, painted swatches and other random bits, all pinned up overlapping one another. When I start working on a new collection, the colourways are one of the most important parts to get right, and inspiration usually comes from my large stock of nature-based photography. 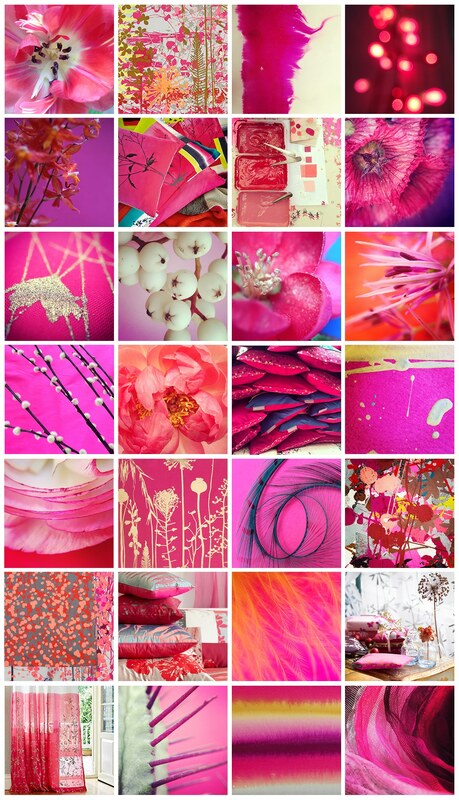 Perhaps surprisingly, I find pink a really versatile colour. In previous collections it has been found clashing loudly against red or lime green, or subtly fading into plum and grape. My all-time favourite shade is coral – I love the shot of the peony in the middle here, gently unfurling its silky leaves to show off its sunflower yellow stamina.